Attention young drivers! What would you do with $200.00? Paying it as a fine is probably not on the top of your list, but that could be your reality if you text and drive. According to MO Department of Transportation, “You text, you’re next.” Since 50% of teens admit to texting while driving, you truly could be next. Distracted driving includes texting, eating, talking, changing the radio station, or any other interruption that takes your eyes off the road. It only takes a split second to change a life forever, and over 80% of crashes involve distractions. Take a few seconds to educate yourself and peers to avoid common, and possibly fatal, distractions. Commit to distraction free driving today, and don’t let an emoji wreck your life! Fully focus on driving. Do not let anything divert your attention, actively scan the road, use your mirrors, and watch out for pedestrians and cyclists. Store loose gear, possessions and other distractions that could roll around in the car, so you do not feel tempted to reach for them on the floor or the seat. Make adjustments before you begin your trip. Address vehicle systems like your GPS, seats, mirrors, climate controls and sound systems before hitting the road. Decide on your route and check traffic conditions ahead of time. Finish dressing and personal grooming at home, before you get on the road. Snack smart. If possible, eat meals or snacks before or after your trip, not while driving. On the road,avoid messy foods that can be difficult to manage. Secure children and pets before getting underway. If they need your attention, pull off the road safely to care for them. Reaching into the backseat can cause you to lose control of the vehicle. Put aside your electronic distractions. Don’t use cell phones while driving, handheld or hands-free, except in absolute emergencies. Never use text messaging, email functions, video games or the internet with a wireless device, including those built into the vehicle, while driving. If another activity demands your attention, instead of trying to attempt it while driving, pull off the road and stop your vehicle in a safe place. To avoid temptation, power down or stow devices before heading out. Drivers should use caution while using voice-activated systems, even at seemingly safe moments when there is a lull in traffic or the car is stopped at an intersection, because potentially dangerous distractions can last longer than most drivers expect. As a general rule, if you cannot devote your full attention to driving because of some other activity,it’s a distraction. Take care of it before or after your trip, not while behind the wheel. ACT Missouri would like to extend our gratitude to the National Highway Traffic Administration for this information. BOSTON (December 1, 2015) While so much rightful attention has been paid to the dangers of distracted driving in recent years, a new study released by Liberty Mutual Insurance and SADD (Students Against Destructive Decisions) reveals that teens are still neglecting the most basic rules of the road – from observing speed limits and wearing seatbelts to engaging in aggressive driving behaviors – and parents are largely unaware. With fewer hours of daylight, winter road conditions and busy holiday traffic, it’s critical that parents discuss getting back to the basics with their teen drivers – not only during winter months, but all year round. Despite a majority of teens (81 percent) who consider aggressive driving to be dangerous, more than one-third (36 percent) admit to having an aggressive driving style, revealing a disconnect between teens’ understanding of safe driving and reality. Even more alarming, 31 percent of teens say they have retaliated or experienced road rage when provoked by another driver – creating a dangerous environment for everyone on the road. According to NHTSA, aggressive driving is defined as an individual committing a combination of moving traffic offenses, such as driving above the speed limit and cutting off other drivers; while retaliatory driving, also known as “road rage,” is defined as an assault with a motor vehicle, which is a criminal offense. The new data shows these behaviors go largely unnoticed by teens’ parents – with only 16 percent reporting their teens drive aggressively and 13 percent thinking their teens have retaliated when provoked – showing the need for a reality check among parents about their teens’ hazardous driving habits. With winter and holiday driving conditions in full swing, ignoring the basic rules of the road can be dangerous. In addition to aggressive driving styles, the new survey reveals teens are not only neglecting the driving basics, but are also failing to observe the law. For example, one in five (18 percent) teens admit to not wearing a seat belt. Also alarming, while the majority (89 percent) of teens may consider themselves “safe drivers,” 71 percent of these “safe drivers” admit to speeding. However, this is news to parents. While the majority of teens may disclose their speeding habits, less than half (38 percent) of parents actually believe their teens speed. In addition, teens who have driven for one-plus years are more likely to speed (47 percent) than those who have had their license for less than six months (28 percent) – showing that more experience behind the wheel does not prevent reckless driving behaviors. Of those same self-described “safe drivers,” two-thirds (67 percent) admit to transporting three or more teen passengers in the car, and only 26 percent of all teens perceive this to be distracting. According to NHTSA, the risk of a fatal crash goes up in direct relation to the number of teens in the car; and therefore it’s important for teens to understand the ramifications and dangers of driving with multiple passengers. Just as concerning, parents are also largely unaware of this behavior, with only 40 percent reporting that their teens drive with three or more passengers in the car. Parents and teens must recognize the dangerous implications of forgetting the basics of road safety – not just the use of technology and social media – to reduce these risks on the road. The report also showed that only 9 percent of teens have formal family driving rules. It’s essential for parents and teens to have open and honest conversations and set expectations around responsible driving. That’s why Liberty Mutual Insurance and SADD encourage parents and teens to consider signing a Parent-Teen Driving Contract. The contract is both a conversation-starter about safety issues and a customized agreement that provides both parents and teens an easy roadmap to uphold family driving rules and encourage open communication leading to safer behavior behind the wheel. Whether teens are planning to get a permit or are already on the road, this guide demonstrates a commitment to safe and responsible driving. The signed agreement can help earn mutual trust to give better peace of mind. To download a contract, visit www.LibertyMutual.com/TeenDriving. 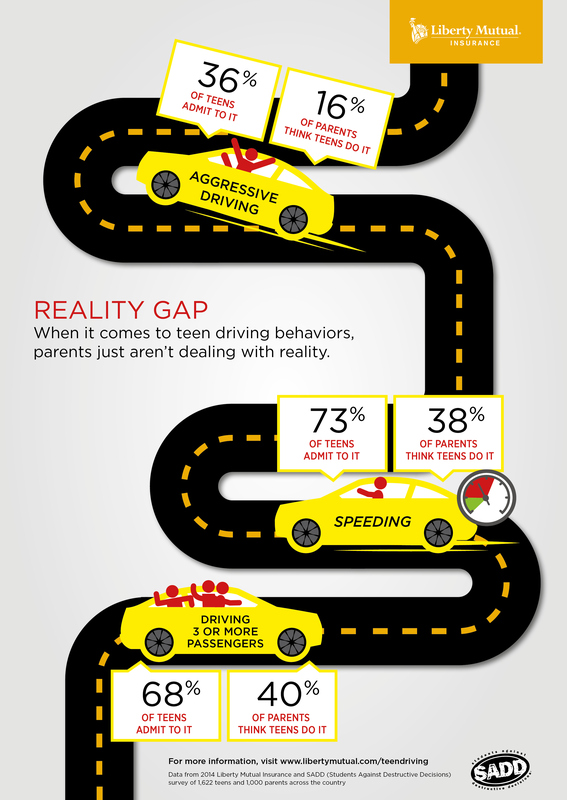 Liberty Mutual Insurance and SADD commissioned ORC International to conduct a qualitative and quantitative methodology to measure teen driving attitudes and behaviors. The study was initiated with a series of focus groups held in Chicago, Ill. and Washington, D.C. from October 28 – October 29, 2014, followed by a survey among 1,622 eleventh and twelfth graders from across the country. Overall the findings from the study can be interpreted at a 95 percent confidence interval with an error margin of +/- 2.23 percent. Error margins for subsets such as licensed drivers will be wider. Additionally, the study surveyed 1,000 parents of high school aged teenage drivers, providing an overall error margin of +/- 2.94 percent. Belton Cares’ After Prom Party is an event held the evening of prom from midnight to 4 -5 am at a local gathering spot, Aaron’s Family Fun Center. The goal of the After Prom Party is to offer an alternative place to go, so teens can gather and enjoy the evening while staying safe and sober. Juniors and seniors, along with their dates, are welcome to attend. The event provides plenty of entertainment with music and a dance area, snacks and soft drinks, goody bags, and lots of other fun activities such as sand volleyball and miniature golf! Belton Cares has been providing this event for almost 15 years. Each year, approximately 200 juniors and seniors attend out of 995 students. The school provides support by promoting the event in the school announcements and through other high school media, as well as selling tickets in the cafeteria. The after-prom party has also gained community support. Community businesses, civic groups and parents donate prizes, cash and time. The event space costs $2,500 and event prizes are around $1,000. These costs are paid by donations and fundraisers. Know your agenda and provide the information to your parents. Plan ahead what you will say or do if someone offers you alcohol or another illegal drug. Phrases such as “No, thanks,” “Are you kidding? I want to remember this night!” or “Actually, I’d rather have a soda. Do you have one?” often work, even if you think they won’t. Know your date before you go. If your date is someone you do not know well, spend a little time together in advance. Take a walk at a park or go for an ice cream before the big night. You and your parents will feel better about your staying out late with someone you know. Find out what your curfew is, and tell your date and/or your friends before prom night. Discuss with your parents any after-curfew possibilities (the party at your friend’s house or early morning breakfast at your place). Ask a trusted adult to be near a phone and available on prom night in case you need to call. If you have cell phone, make sure it is fully charged, or carry a phone card or enough change to make several phone calls from a pay phone if necessary. February 21st is #SubstanceFreeSaturday! This Saturday would be a great time to invite some friends over, or hang out with your family and have a movie marathon! You can also make some yummy snacks to go along with your movies. Need some ideas? Harry Potter: Here are a ton of fun recipes to try, from Butterbeer to Cauldron Cakes! Lord of the Rings: Lembas Bread is the way to go. Marvel Cinematic Universe: Captain America’s Breakfast S.H.I.E.L.D. is a fun vegetarian option! Star Wars: Who doesn’t love a Watermelon Death Star? Twilight: Edward’s Cornflake Chicken: yum or done? Of course you could also just serve up some popcorn and soda, but where’s the fun in that! Snap a #SubstanceFreeSelfie, and tag us on Facebook or Twitter so we can see all the fun you’re having! Does your school have a Student’s Against Destructive Decisions (SADD) Chapter? Have they resubmitted their paperwork this year? Do you want to start a new SADD Chapter? Well, you’ve come to the right place! There are all kinds of benefits to joining SADD, including participating in the annual “It Only Takes One” Campaign, attending Speak Hard (the annual Youth Prevention Conference), and helping your community stay substance-free. Many of they MYAA Youth Ambassadors are also active in their local SADD Chapter. If you want to get more involved in SADD, be sure to check out the SADD page on our website!